Tail-wagging hosts greet guests at the 43rd annual affair. 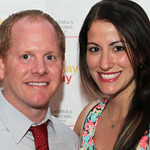 Heath Randolph and Val Perez chair Young Professionals event. Last year’s competition raised more than $500,000 for research and patient support. Cocktails-and-shopping in the fight against cancer. It takes time and talent to execute top-notch events. LLS honored those who made it happen over the past year. Legendary golf instructor and PGA champion dish on the masters, offer tips at American Cancer Society program. The former New York Knicks great shared influences in his life during the tipoff meeting of a new Jewish Federation group. Amid rare palms and magnificent sculpture, author Caroline Seebohm discusses her new book on Ann Norton.